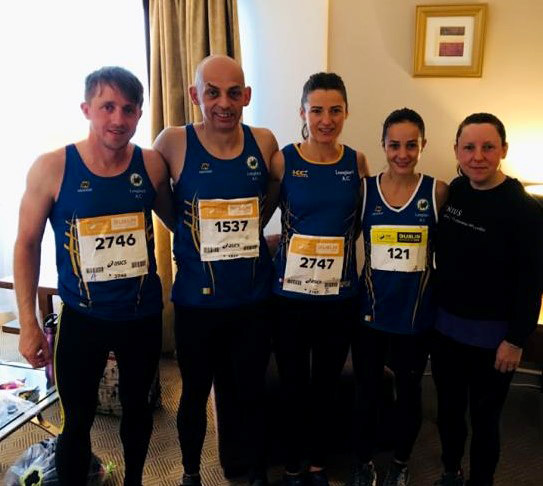 Congratulations to all Longford AC adult members that completed the 26.2 mile marathon distance in Dublin, it’s a fine achievement to get the required training done and make it to the finish line. Well done to everybody especially those new to the distance. There were some outstanding times and new Pb’s. Three Longford AC members managed to achieve impressive results in their age category finishing inside the top 15. Longford AC Juveniles were out in force on Monday 2nd October to take part in the Ray Flynn Tribute Mile. The event was organised by Irish Runner and the Liam Fenelon of the Longford Marathon Committee to celebrate the 35th Anniversary of Ray Flynn’s Irish mile record that still stands today, 3:49.77 minutes set on July 7, 1982 in Oslo at the Bislett Games. A large crowd of 122 runners, including Ray Flynn and Enda Fitzpatrick, took to the starting line on the Ballinalee Road finishing at the Cathderal. Running a paced mile was a new experience for nearly all the juveniles, following more experienced pace setters at 5, 6, 7 and 8 minute times. Its not every Monday night that members of Longford AC get the opportunity to run with a local legend who is a 2 time Olympian and Irish record holder! Here’s another picture set for our recent 10k courtesy of Peter Mooney. OK folks, here it is, the Video of our 10K Road Race held on 18th March 2013. The second race in the Longford AC Summer Running Series 2012 was the 10K race which was held on Sunday 29th April. The weather was certainly cooler for this race when compared to the 5K event held in March but this did not deter anyone from turning up for the event. Weather conditions were sunny with a strong breeze which certainly helped the competitors in the finishing straight, not sure if it was a help any where else along the course. For the first time in this series, there were two local winners and this bodes well for the future of athletics in the club and region. Donal Mulligan won the men’s race in fine style in a time of 37 minutes and 35 seconds, over a minute quicker than the second placed finisher. Donal certainly has the talent and is looking forward to the next race. He was never in trouble throughout the race. Second home was John Ryan in a time of 38 minutes and 42 seconds and third finisher was the fast improving Lorcan Gearty in a time of 38 minutes and 48 seconds. Lorcan races all distances from 5K to marathons. A very impressive winner of the women’s event was Michelle McGee in a quick 39 minutes ad 16 seconds and she had over 4 minutes on the second place finisher. This was a fantastic run by Michelle and shows she was a rich talent for the event and no doubt we will hear more from Michelle in the near future. Second was Imelda Martin in a time of 43 minutes and 28 seconds and Veronica Reilly was third in a time of 43 minutes and 31 seconds.